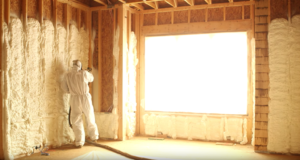 Way back when home being energy efficient was just coming into vogue, I started my company with the goal of providing Western New York with the best high-quality foam insulation. Since that time we’ve sprayed or injected icynene foam on thousands of residential, commercial, and industrial projects. Icynene foam is arguably the best product on the market to conserve energy in a clients living space. We are hiring for two entry-level Insulation Apprentices. We’re a small company with a welcoming atmosphere. We offer paid vacation, personal days, and a 401k match. Will have a certain knack, or ability. We call it aptitude. Will have a can-do, positive attitude. Will have good knees and flexibility. If you’ve ever crawled around in an attic space or a crawl space you’ll understand what I’m referring to.